All transactions are safe and secure with a reliable history in online purchasing behind each of our associates. 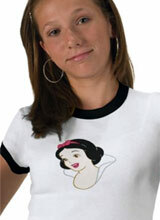 Buy the Snow White Face t-shirt to own Snow White clothing and merchandise. If you are looking for a simple Snow White t-shirt then this tee is perfect for you. It comes in a variety of styles and colors for children and adults, so no one in the family is left out. The simple design lends itself to being dressed up or down depending on your mood and activity. You could even bake your own gooseberry pies in them if you want to! After all, it is one of her specialties and one of the dwarfs' favorite homemade treats. For other great Snow White shirts, keep browsing our collection which includes Disney Seven Dwarf t-shirts like the Grumpy shirt and Dopey tee. In addition to the Snow White Face tee above, browse the Snow White Clothing Gallery for more apparel like men's and women's clothes, kids shirts or hoodies.